Search Results: 16 results in 0.0096 seconds. Web Serial Monitor is one of the built-in embedded web apps in PHPoC [WiFi] Shield. Web Serial Monitor is accessed on web browser through Internet (Serial Monitor is accessed on Arduino IDE through USB cable). Web Serial Monitor can be accessed from any OS (Android, iOS, Windows, macOS, Linux...) without any installation. 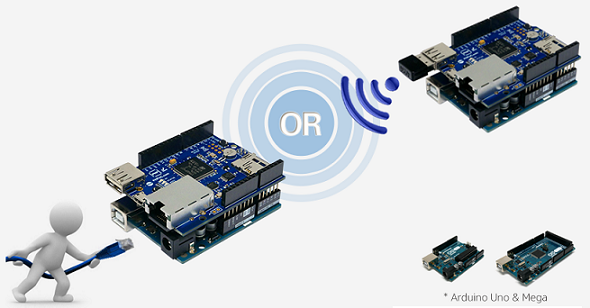 Therefore, you can monitor Arduino from mobile devices. This is an example of using Arduino Uno/Mega and PHPoC [WiFi] Shield to send an email. Web Remote Push is one of the built-in embedded web apps in PHPoC [WiFi] Shield. When an user presses/releases a button on this web apps, the web app sends an uppercase/lowercase characters corresponding with the name of button to Arduino via WebSocket. This tutorial shows how to use Web Remote Push to control Arduino. Web Remote Slide is one of the built-in embedded web apps in PHPoC [WiFi] Shield. When an user moves a slider on this web app, the web app sends the slider name and slider value to Arduino via WebSocket. This tutorial shows how to use Web Remote Slide to control Arduino. Web Remote Pad is one of the built-in embedded web apps in PHPoC [WiFi] Shield. When an user clicks or touches on touchable area of this web app, the web app sends x, y coordinates and touch's state to Arduino via WebSocket. This tutorial shows how to use Web Remote Pad to control Arduino. Web Serial Plotter is one of the built-in embedded web apps in PHPoC [WiFi] Shield. Web Serial Plotter is accessed on web browser through Internet (Serial Plotter is accessed on Arduino IDE through USB cable). Web Serial Plotter can be accessed from any OS (Android, iOS, Windows, macOS, Linux...) without any installation. This is an example of using Arduino Uno/Mega and PHPoC [WiFi] Shield to make an HTTPS request to a IPv6 web server and get web content in response. Web content is a HTML file and printed to serial monitor. This is an example of using Arduino Uno/Mega and PHPoC [WiFi] Shield to make an HTTPS request to a web server and get web content in response. This is an example of using Arduino Uno/Mega and PHPoC [WiFi] Shield to make an HTTP request to a IPv6 web server and get web content in response. This is an example of using Arduino Uno/Mega and PHPoC [WiFi] Shield to make an HTTP request to a web server and get web content in response. This is an example of using Arduino Uno/Mega and PHPoC [WiFi] Shield to send an email via Gmail Relay Server. This tutorial show how to use Arduino Uno/Mega and PHPoC [WiFi] Shield to create a Telnet server that can connect up to 4 Telnet clients simultaneously. It distributes any incoming messages to all connected clients. The incoming messages are also printed to the serial monitor. TCP is abbreviation of Transmission Control Protocol. TCP is one of the popular protocols in Internet. To exchange data between two devices using TCP protocol, one device acts as TCP server, the other acts as TCP client. TCP server listens to wait for TCP connection request from TCP client. TCP Client actively make request for TCP connection to TCP server. All times are GMT+9. This page was generated at 05:27 AM.